It was bad enough that the company that owns the pipeline sent in hired goons to attack peaceful protesters. Now the state is sending in its hired goons to do the same thing to people who are simply praying and protesting to stop work on a pipeline that is supposed to be on hold. 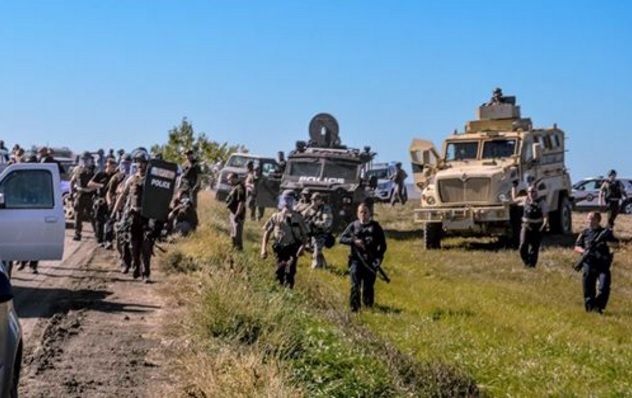 According to the Censored News blog, the police surrounded protesters with automatic weapons, military-style armored vehicles, and shotguns, arrested 21 of them, dropped tear gas, confiscated phones, and deleted videos of it all. There a photos and videos at the link. There are also reports of protester access to Facebook being blocked and Facebook deleting protester videos. People have even reported trouble keeping these videos up on Tumblr. How police could possibly justify doing this is beyond me, but I'm sure they'll try. But before they'll even bother, media sources need to pick this up and spread the word. This is worse than the private security company attacking protesters. And this is far from over. The temporary halt order on the pipeline's construction was likely only to appease the masses and get people to declare premature victory, then forget about it. Don't let them trick you. Don't forget about it. Keep speaking out.